Being the pasta aficionado that I am, when I gazed at the online menu at Hippo in Highland Park, I knew this was a spot we needed to hit. In fact, we’ve hit it a couple of times in the past two months, and let’s just say I’m sure we’ll be back soon. It also offers a lot more than pasta. Hippo had already created quite a buzz even before it opened in the summer of 2018. 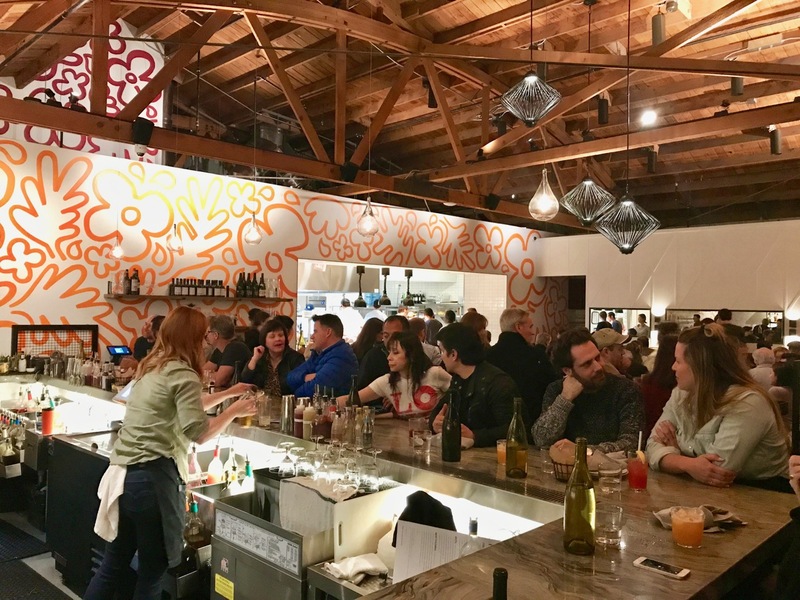 That’s because the restaurant was going to be headed by James Beard award-winning chef Matt Molina (along with Silverlake Wine partners Joe Capella and Randy Clement). 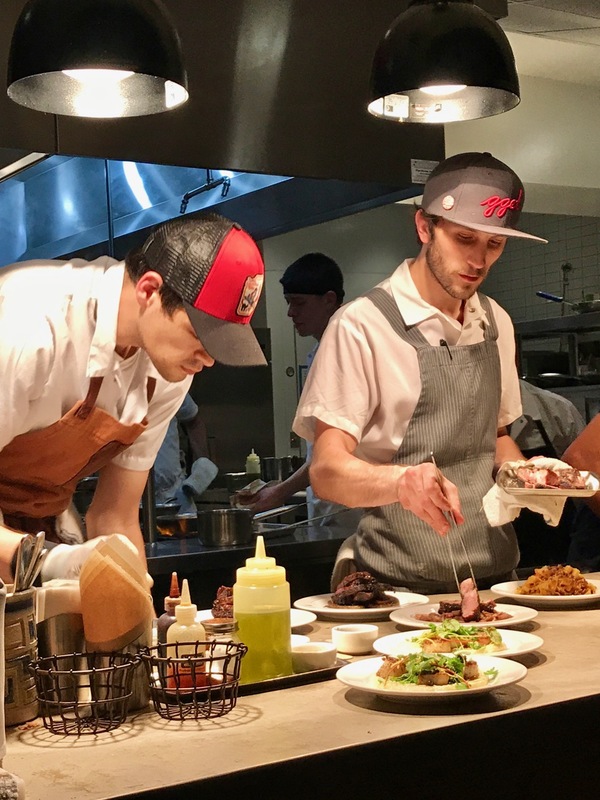 It was back in 2012 that Molina won the coveted Beard award for Best Chef: West for his work at L.A.’s Osteria Mozza, co-owned by chef, baker and author Nancy Silverton. With that pedigree behind the restaurant, hopes were high Hippo would be a resounding success, and from what we’ve seen (and eaten) on our two ventures, it is just that. 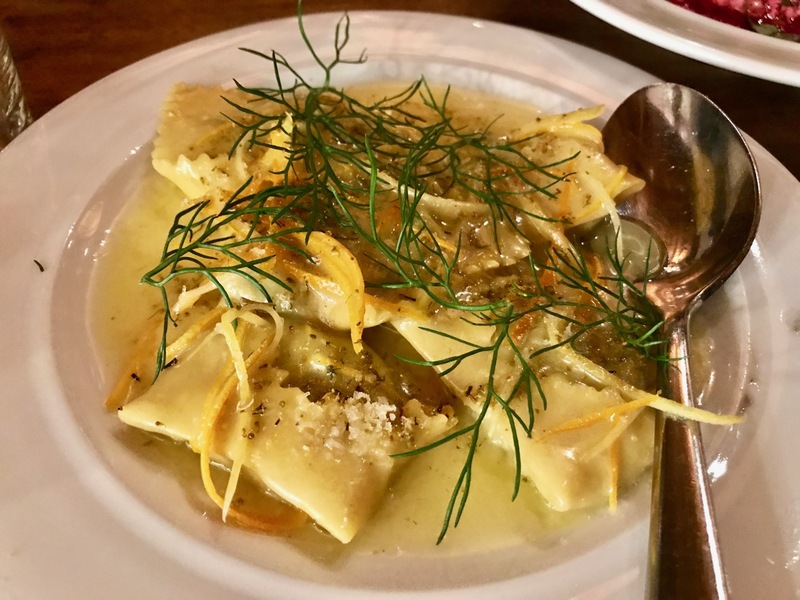 Although there are a number of pasta dishes, Molina calls his cuisine Cal-Med, which sounds like my nearby Urgent Care facility I frequent, however it really stands for California Mediterranean. Cal-Med cuisine was supposedly a trend in the 1980s, but since I didn’t have enough money to go out to dinner in that decade, I don’t remember it. 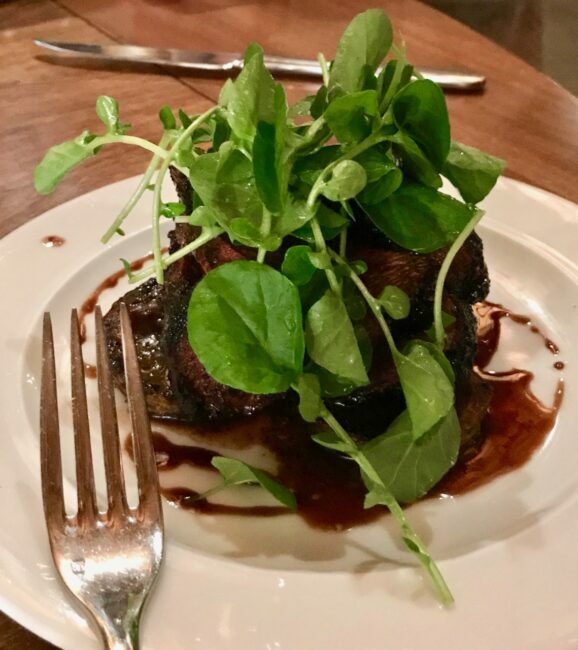 On our initial foray to Hippo, Tracy and I (along with my Seattle cousins Susie and Bill, and friend Susan) scored a 5 p.m. Sunday reservation (the only time available when I went online ten days previously … yes, it’s that popular). 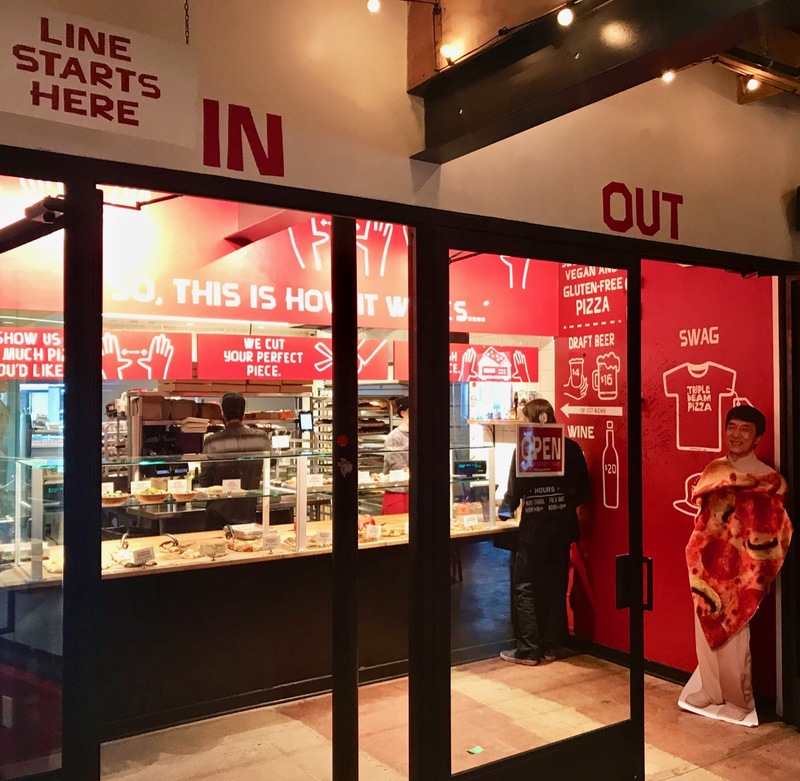 The restaurant is hidden from the street, and we walked through a small passageway occupied by Silverton’s popular Triple Beam Pizza and Go Get Em Tiger Coffee, which also serves pastries and breakfast. This is all part of a complex, which I believe is named the Hippoplex. It also includes the Highland Park Wine Shop run by the Silver Lake Wine guys. 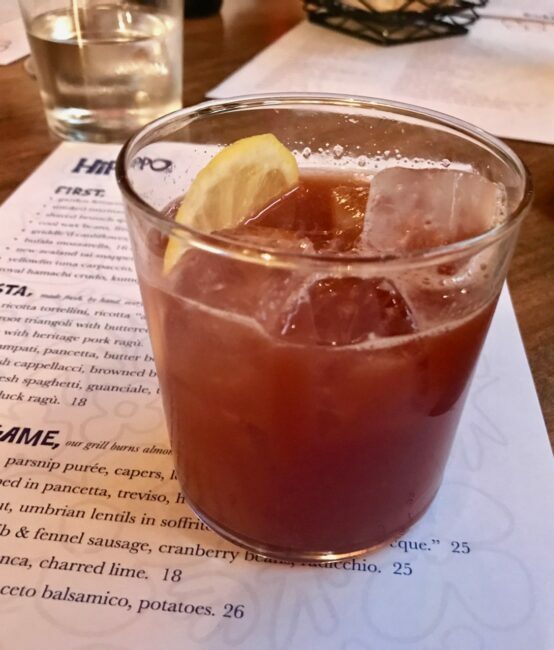 Stepping inside Hippo, this 80-seat establishment was just seating its first customers. A half-hour later, there was a line to get in. As is so prevalent these days, the industrial-type interior with a high-ceiling makes for a rather loud environment, but we were incredibly lucky to get a round table adjacent to the open kitchen in the front of the restaurant, so the noise level was bearable for conversation. 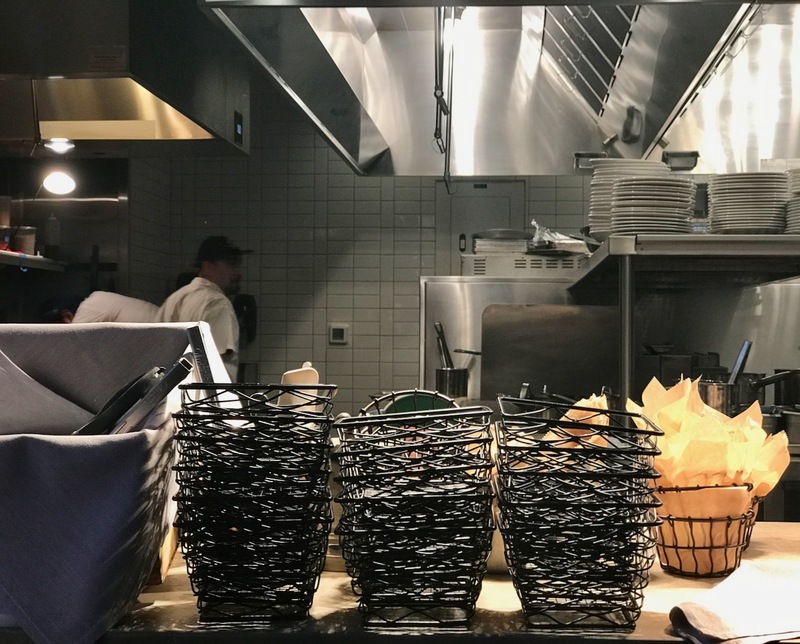 This table is a great spot to watch the plating and finishing of dishes as they came out of the kitchen. It’s quite an operation (more on that later). 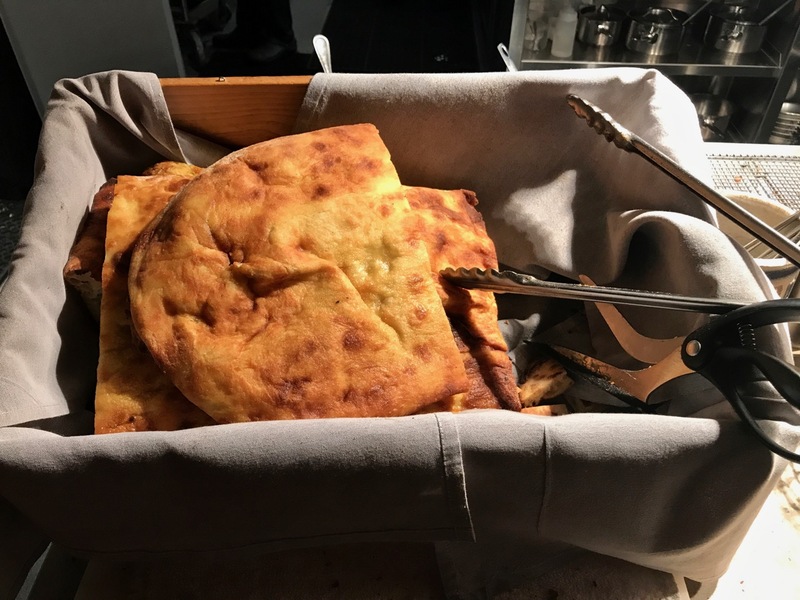 Watching the just-out-of the-oven, fresh baked focaccia bread arriving on a long wooden board from Triple Beam Pizza whetted our appetite. It was set enticingly just out of our reach (that probably would have been bad form no matter how much I was tempted). The bread would come whizzing by our table throughout the evening (so good!). 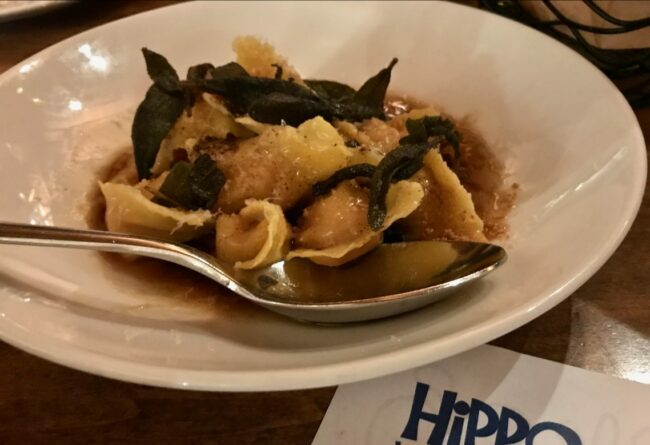 As is the norm with so many new restaurants, most of the dishes at Hippo are meant to be shared. We chose from “First,” “Pasta” and “Meat, Fish. Game.” We ate so much of the darned bread (delicious) that we never got to the last part of the menu. Witnessing first-hand the meat, fish and game being plated at the counter ensured that we would be returning here to try more menu items. 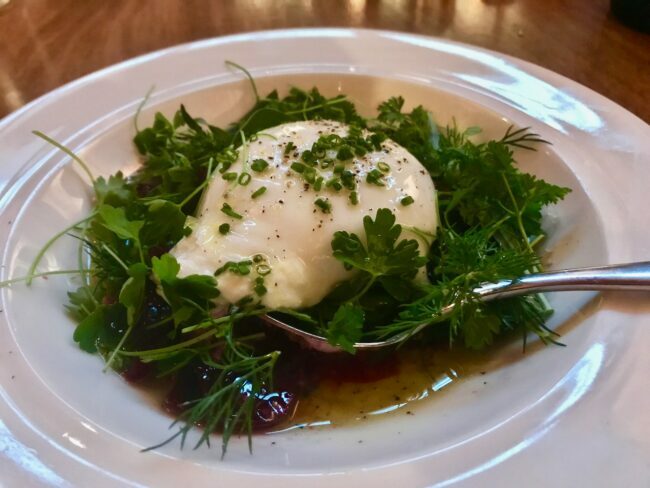 From the “First” category we shared Smoked marinated beets in sherry vinaigrette, burrata and herb salad ($9). This opening dish gave us an idea that this would be a special evening. 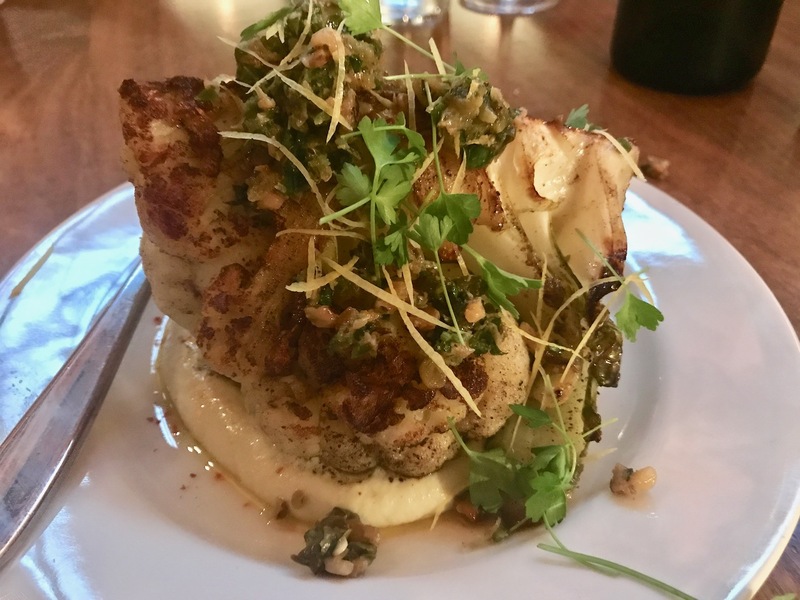 Next up was the Griddle’d cauliflower on a bed of cauliflower “tahini” with walnut, raisin and caper relish ($12). That was an incredible dish, and if anyone ten years ago told me I would use “cauliflower” and “incredible” in the same sentence I would have had them committed. The Bufula mozzarella, 16-month prosciutto di San Danielle, Fett’una ($15) also shined. 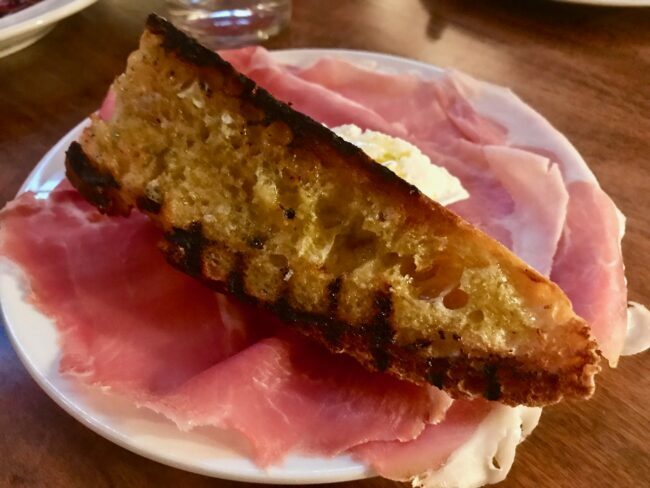 I believe I could live on prosciutto, and the bread was grilled to perfection. 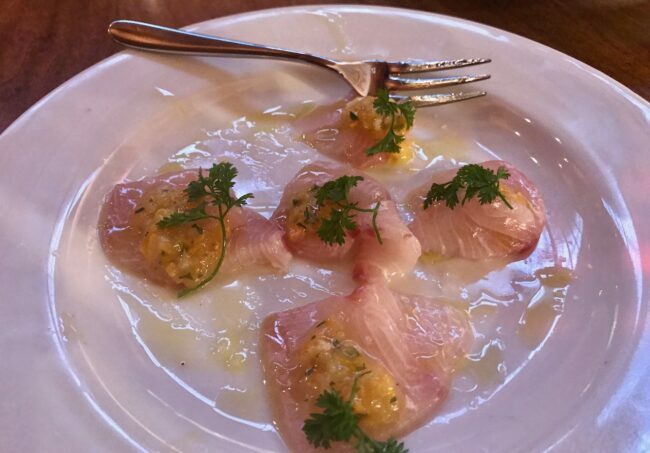 Besides the cauliflower, the biggest star of the First round was Royal Hamachi crudo with kumquat prosecco relish ($16). Our server recommended this as a palate cleanser, and that description shortchanges the incredible flavor we experienced. Everyone loved it. By now, I was wishing we hadn’t had that second basket of bread. Of course, I ate two more pieces. Now we were on to “Pasta” time. There wasn’t much sharing on this round as we all devoured the dishes we selected. 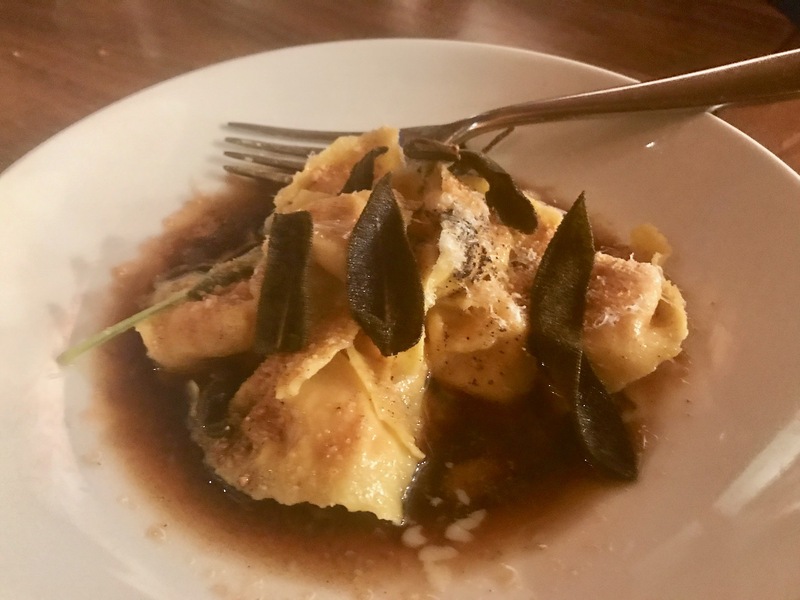 I ordered the Winter squash cappellaci with browned butter, sage and Amaretti ($19). 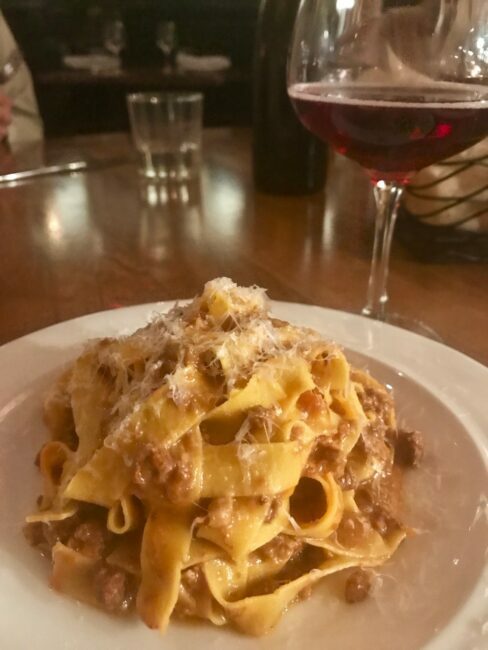 The amaretti added a delicious crunch to this tremendous pasta dish. Wow! 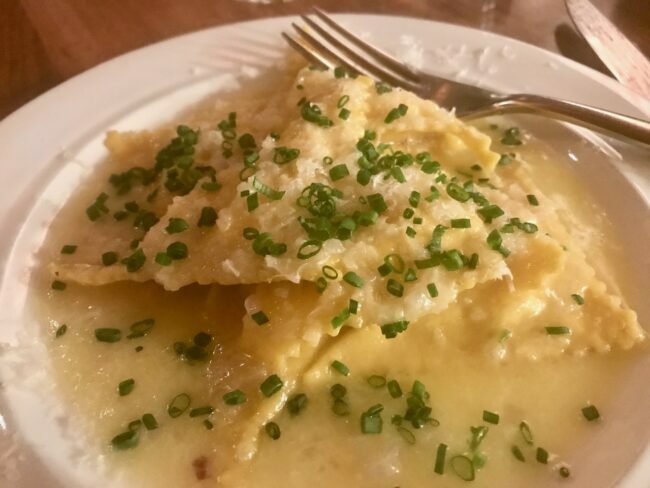 Another “Wow” went to Tracy’s and Susie’s Celery root triangoli, buttered shallots and chives ($18). 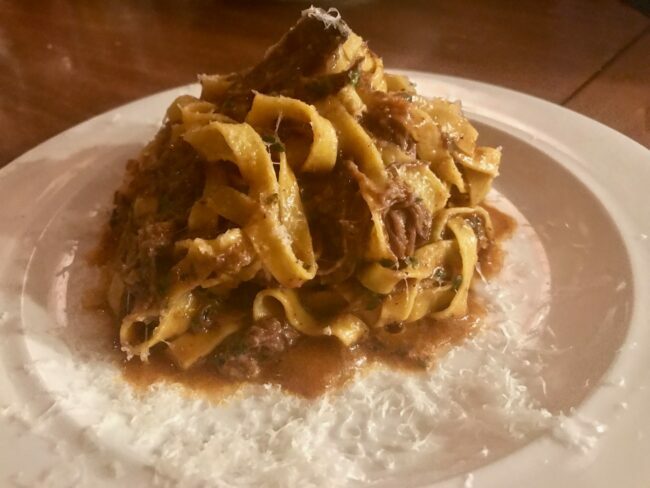 Not to be outdone were Susan’s Tagiolini with duck ragu ($18) and Bill’s Fettucine with Heritage pork ragu ($19). By the time we were done not a strand of pasta could be found on any of our plates. 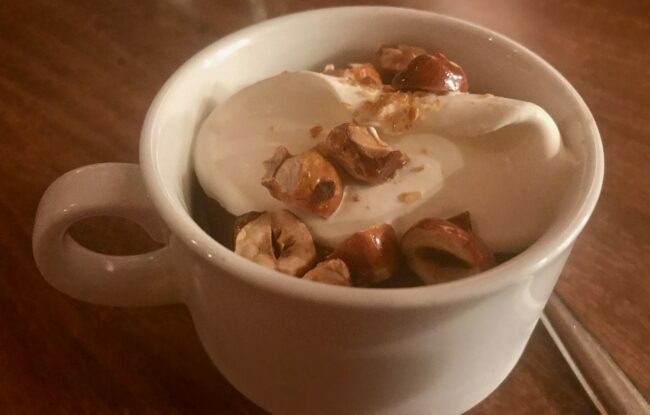 For dessert, we ordered an espresso pot de crème, dark chocolate, candied hazelnuts and sea salt ($10). It was good, but I still couldn’t get the memory of my pasta out of my head. We vowed to return. We returned once again in late March. Uber was our friend on this appearance, and Tracy and I arrived a few minutes early for our 8 p.m. reservations and enjoyed an Old-Fashioned and a Manhattan respectively. Tonight we’d be dining with our friends the Chicas (Joanne, Helen … who was celebrating her birthday … along with Gema and Xochiti). Once again we scored the round table in front of the kitchen. Our server, Maya, was stupendous paying special attention to the various allergies at our table and making recommendations so the EpiPen would not be needed. Helen ordered the Mariachi on the Beach; tequila, passionfruit, aperol, coconut, lime, curry bitters and salt ($13), while Joanne ordered off the special $10 cocktail list (it changes each month). This month’s “March Madness” list included Peas, Can I Have a Drink? ; mi campo tequila, ginger, lime muddled snap peas and agave. I helped Joanne drink it. I’m always here to help. On this evening our table shared a few items we had on our prior visit, the smoked marinated beets and burrata, the Griddle’d cauliflower and the winter squash cappellaci plus two new items. 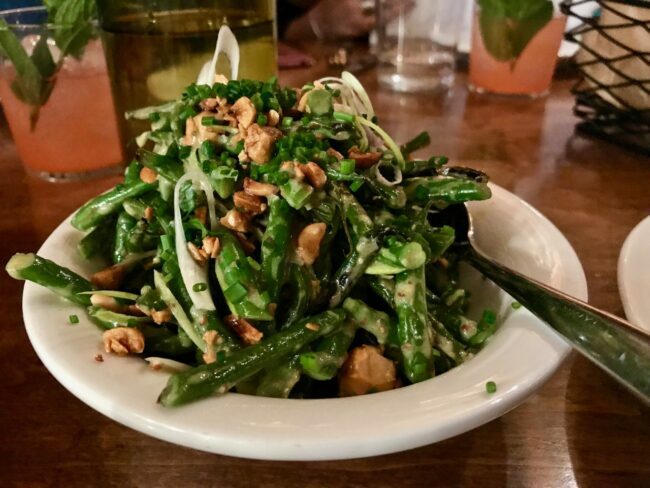 Tracy and I thought the Cool Haricot Verts; Fresh serrano chili, Toasted hazelnuts, Frenchie vinaigrette ($9) were phenomenal, while a couple of others were less enthusiastic, but most gave it a thumb up. The Fresh ricotta tortellini with fennel ($16) to me was a “wow” dish. This time we didn’t eat quite as much bread, so it was on to the “Meat, Fish, Game” category. Joanne and I opted for the Barbecued porcini rubbed sirloin steak, Acento balsamico, Potatoes ($26). This spicy steak dish is pre-sliced and my medium-rare steak was cooked to perfection. Tracy and Birthday Girl Helen ordered: Griddle’d Sea Scallops, Parsnip puree, Capers, Lemon, Parsley ($24). 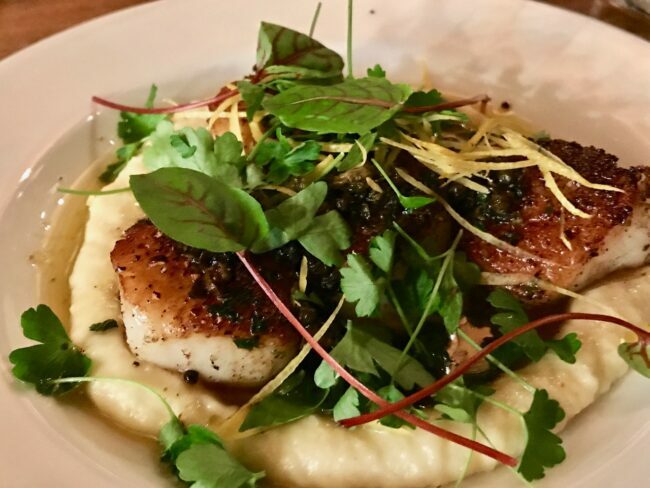 Tracy loves scallops and her smile meant this dish hit the spot. 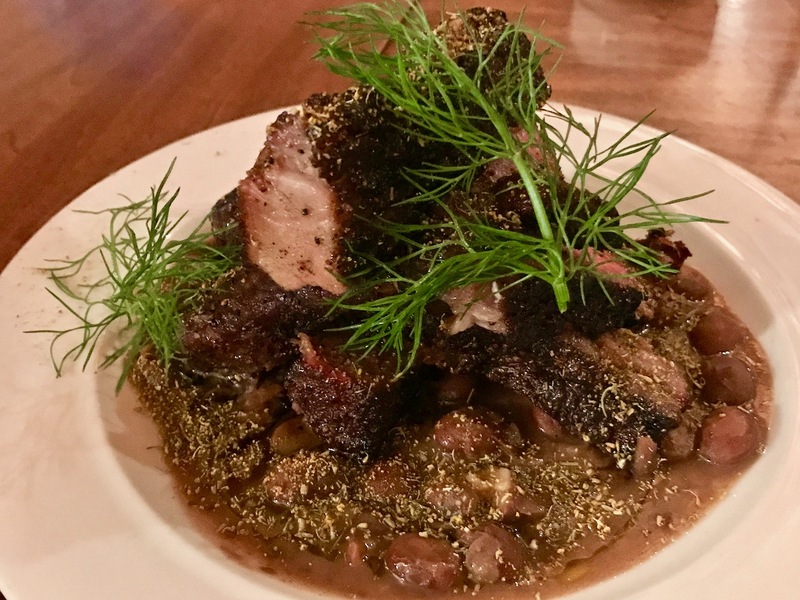 Gema tried the Barbecued pork country rib & Fennel sausage, Cranberry beans, Radicchio ($25), which she enjoyed. It’s a large dish featuring lots of pork. Since we were sufficiently satiated, we were going to pass on dessert, but as it was Helen’s birthday they offered her an espresso pot de crème with a birthday candle. 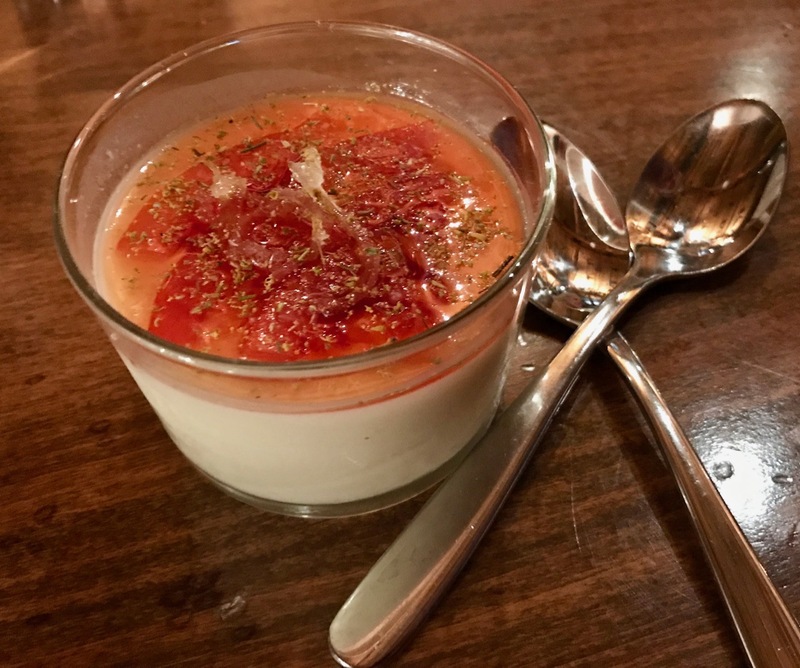 Well, we certainly didn’t want Helen to eat alone so we ordered Buttermilk Panna Cotta topped with sautéed blood orange and fennel pollen ($10) for the rest of the table, which was excellent. If possible, try to get a table near the kitchen. It was a great experience to see this team hard at work. It was like viewing a food ballet as each individual stuck to his or her task creating these delicious and great looking dishes. 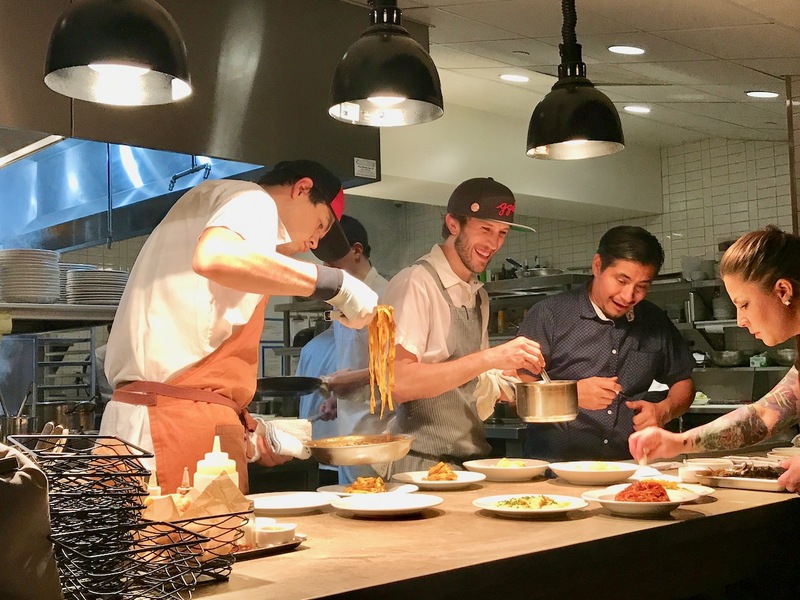 Although working at a torrid pace, they all seemed to have a smile on their face throughout as they painstakingly made these dishes as beautiful as they could. 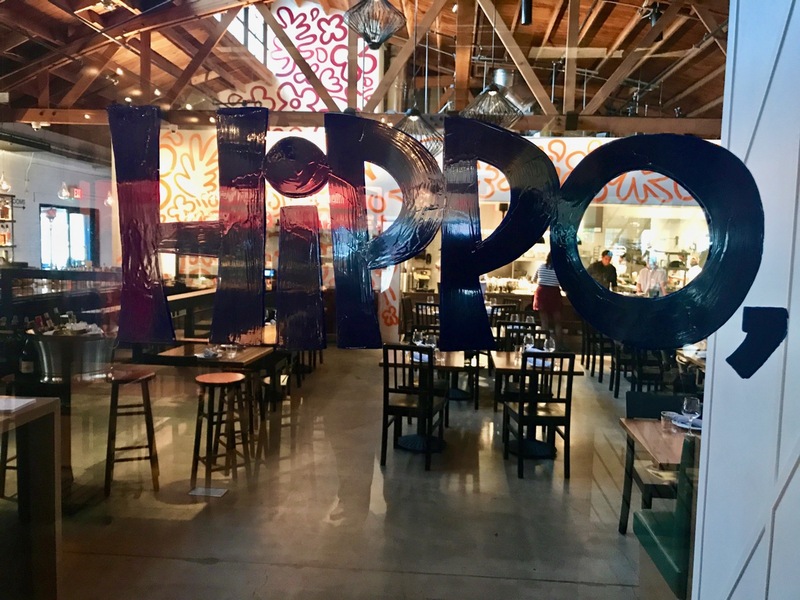 I also believe Hippo has a patio, which would be a great place to dine during the warmer months (yes, L.A. has been cold recently). I do wish they had a corkage fee (no outside wines allowed). I have some Italian wines from our recent Piemonte trip in my wine cave at home that would have paired nicely with some of these dishes. I will say the glass of a Grenache/Carignan/Cinsault blend I bought each time ($12) was very good. Hippo’s bottled wine selection prices are fair (especially for Los Angeles). There are at least eight bottles in the $40 – $50 range. Hippo also adds 3% to the bill for health insurance. Living in L.A., I’m starting to get used to that charge, but truthfully I wish restaurants would just add 3% to the food bill. Hours: Tuesday – Thursday & Sunday 5 p.m. – 10 p.m. • Friday/Saturday until 11 p.m.